It's WWE's final pay-per-view of 2013, so you think they'd want to finish with a flourish, right? 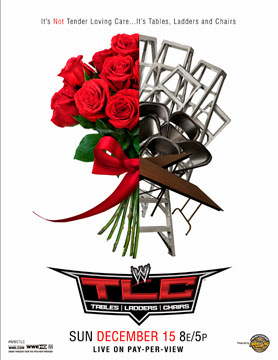 TLC: Tables, Ladders and Chairs is entering it's fifth year on the WWE PPV schedule, and for a gimmick PPV has usually fared quite well, offering up matches like Christian vs. Shelton Benjamin in a Ladder match in 2009, John Morrison vs. Sheamus in another Ladder match in 2010, CM Punk vs. Alberto Del Rio vs. The Miz in a TLC match in 2011, before last year presented possibly the best incarnation of the PPV to date, with The Shield taking on Ryback and Team Hell No in the standout bout of the evening. However, this year we've seen WWE hold back a little on the Tables, Ladders and Chairs, in fact you'll find more three-on-one handicap matches on this show than you'll find any of the weapons mentioned abouve. This could be seen as a way to stress the importance of John Cena and Randy Orton's title unification bout that main evented the show, however it does feel rather strange to have a show that is sold on having Tables, Ladders and Chairs and only have one match involving any of those weapons. Right, let's get into the show shall we! The show kicked off in a similar way to Survivor Series three weeks ago, with Triple H and Stephanie McMahon coming out to hype up the main event of the show. Whilst I didn't have too many problems with the promos that either delivered, I didn't really see the point of this opening segment, it felt very similar to an episode of Raw, where the objective would be to keep the audience interested and keep them tuned in for the whole show by hyping what was to come, however within the context of a Pay-per-view in which everyone already knows what they will be seeing and have decided to pay for already, there really doesn't seem much point, apart from filling some PPV airtime. After that followed a delightful opening video package, focusing once again on John Cena and Randy Orton's main event contest. Whilst, as usual, this package was very well put together, the opening segment with Triple H and Stephanie McMahon had already made it redundant, which was a shame. After some pyro and ballyhoo, it was time for our opening contest. I had been fairly sceptical about how WWE would manage to keep both handicap matches interesting for an decent amount of time and to their credit they did a good job with both. This was a pretty straight forward divide and conquer storyline, with the idea being set up early on that when The Shield were on the same page they could dominate Punk fairly easily. After a slow start, the catalyst for the match getting interesting was Roman Reigns missing a spear on the outside, that sent Reigns flying over the top of the announce table, with JBL and Michael Cole on commentary getting over that Reigns had somehow injured his eye in the collision well, whilst Jerry Lawler was distracted by some puppies. The strongest wrestling section of the bout saw some nice interchanges between Punk and Seth Rollins, with Punk getting a number of near falls on the former tag team champion, including Rollins spending some time in the Anaconda Vise with United States Champion Dean Ambrose made the save. The final stages of the bout continued to play on the dissention in the ranks of The Hounds of Justice, with Rollins taking a GTS from Punk, Punk attempting a GTS on Ambrose, only for Ambrose to slip free, with Reigns charging into Ambrose with a thunderous spear, after Punk had side stepped Reigns. After Punk had bundled Reigns out of the ring, the Best in the World was able to pick up the pinfall victory on Reigns. The bout was kept to the right length to tell the story it needed to do, and whilst many will bemoan The Shield losing to a single man, the way the bout was layed out shouldn't really draw any complaints. Backstage, the lovely Renee Young interviewed Diva's Champion AJ Lee, who was flanked by Tamina Snuka. This was another strong promo from Lee, attacking the WWE fans for not voting for her to win Diva of the Year at the Slammys, and of course talking about her hatred for Total Divas, which is obviously a clever promotion tool for the show. Whilst Lee has the strongest character of any of the women in the division and looks extremely comfortable cutting promos, she needs to be careful not to forget about who her opponent is and therefore bury them by default, it would have been nice to hear her talk up Natalya here, which would have allowed me to be drawn into the match even more, and made it mean even more when she picked up the win. A decent psychical women's bout here, with both Lee and Natalya looking strong throughout. The earlier part the contest was back and forth exchange of holds, before Lee took control by slamming Natalya into the barricade. The strongest part of the bout saw the pair exchanging their signature submission holds for good false finishes, with some nice innovation from both to get out of the moves. The finish saw Natalya locking in the Sharpshooter for a second time, only for Lee to grab a handfull of hair and pick up a pinfall victory with a small package. This match could have benefitted from an extra five minutes or so, as it would have been nice to see Natalya and Lee working body parts to set up for their submission holds and weave in an extra element of story. There was another video package hyping the main event, this time with past champions talking about the importance of the titles. I've pretty much covered this already, again a rather pointless exercise when the PPV has already been bought, and merely came across as a time filling exercise. Before the bout got under way, Damien Sandow cut a cleverly worded promo to attempt to get some interest in this rather rushed together bout. There's no doubt that Sandow's promos are the strongest part of his game, and this one only reinforced that idea, although it would be nice to see him pushed out of his comfort zone with a promo once in a while and bring a bit more edge to proceedings. The match itself really wasn't that interesting, I had been given no real reason to care about the outcome and suspected that Langston would be picking up a fairly hassle free victory. It would have been so much better if Langston had actually been in a feud with Sandow leading into the match, instead Sandow had spent most of the build up in a feud with Dolph Ziggler, whislt Langston was involved in a tag team with Mark Henry. There was no real story built into the bout, with the two running through the motions for a six or seven minutes, before Langston picked up the win with a Big Ending. It wasn't an awful match, and the two looked crisp in the ring, there was just nothing to draw me in and invest in the action. Backstage we saw Vince McMahon meeting with WWE Champion Randy Orton, with some weird sounding audio where you couldn't really make out what was being said, I'm not sure if this was a technical error but it didn't sound right at all. I correctly predicted on Twitter, that we'd see Vince doing the same segment with John Cena later on in the show. Then there was an advert for some American Fast Food, which unless they want to pay me as well I won't mention here! It was then off to the Kick Off panel, this time consisting of the character-less Josh Matthews and WWE Hall of Famers Booker T and Mick Foley. They replayed action from the pre-show that saw a brawl between Kofi Kingston and The Miz, where the only point of interest was Miz struggling to remove his suit jacket. It was revealed that a No Disqualification bout between Miz and Kingston would be taking place later on. Why they did make it a match that would suit the gimmick of the PPV, I don't know. I said in the prediction video for this show (http://www.youtube.com/watch?v=IHH9zt4Q334) that I expected this one to be the match of the night, and it didn't disappoint. The opening stages focused on Goldust bumping around for Ryback and Curtis Axel, with the veteran making the younger guys look great in the ring, before managing reversing Ryback's Powerbomb attempt into a roll up to eliminate the former Paul Heyman guys. It was then The Real American turns to dominate Goldust, really helping to get the crowd behind Goldust in his repeated attempts to make the tag to his brother, only for Cesaro or Swagger to block him off at the pass. They repeated the spot that was used in the three way tag bout at Hell in a Cell, with Goldust looking to have made the tag to Cody, only for Swagger to pull the younger Rhodes brother off the apron. Goldust eventually managed a hot tag to Big Show, who dispatched of Cesaro fairly quickly after hitting Knockout Punches on both Real Americans. It was surprising to see them go down to the two face teams, and I thought this would be the downfall of the contest, luckily that wasn't to be the case. Show and Goldust were quickly taken out by the ring post and the barricade respectively, leading to a very good exchange between Rhodes and Rey Mysterio, with a number of interesting reversals, including Rhodes turning a 619 into an Alabama Slam. This was the best I've seen Mysterio wrestle for sometime, and it was wise to keep him out of the majority of the match until this point, as I doubt he could have wrestled at this pace for much longer. After some back and forth Rhodes picked up the victory with a Cross Rhodes. I wouldn't expect The Rhodes Brothers to be holding onto the Tag Team Championships for too much longer, with their predicted Wrestlemania match only a few months away, who they'll be dropping the titles too is unclear with WWE doing a great job at keeping the tag team division unpredictable lately. A rather bizarre segment followed to promote WWE's Brawlin' Buddies toys, with a whole host of unused talent appearing, including The Prime Time Players, The Great Khali, Los Matadores, Vickie Guerrero, Brad Maddox and Kane. It was mildly humourous at points, with Brad Maddox continuing to make me chuckle with his Anchorman-esque delivery. It all finished with Kane throwing John Cena's brawling buddy to the floor. This bout was unadvertised and the crowd struggled to get into it too much, although they LOVED joining in with R-Truth's signature “What's Up?” catchphrase. This match was designed to continue Brodus Clay's heel turn, with him destroying Truth for most of the match and looking impressive in the process. Clay spent a lot of the match arguing with tag partner Tensai, who eventually left with The Funkadactyls, which lead to Truth hitting a jumping kick and getting the victory with a roll up. This match could easily have just been on Raw or Smackdown, but was entertaining for the time it was on screen. I'm happy to see Brodus Clay in a heel role again, and R-Truth has found purpose alongside Xavier Woods. It was then time for the afortmentioned meeting between Vince McMahon and World Heavyweight Champion John Cena. I would've been feeling like Mystic Meg, if I hadn't got so many predictions wrong! I've seen many on the internet talk about how awful this match was and I have to disagree. The match itself was actually a decent encounter, telling a good solid story, with The Miz working Kofi Kingston's leg to set up for the Figure Four Leg Lock, and Kingston selling the injury like a boss. It was a slow paced bout with very little frills and spills, with the No Disqualification gimmick only really coming into play towards the end, with The Miz removing the turnbuckle cover. The finish saw Kingston counter Miz's Figure Four sending him crashing into the exposed turnbuckle before hitting Trouble in Paradise to pick up the pinfall victory. With Kingston still selling the leg after the bout, it's difficult to fault either wrestler in this one, the main problem would have to come from WWE Creative who have really struggled in getting a clear idea of where this storyline is heading over the last few months. Neither The Miz or Kingston have been used effectively for a very long time, with both losing the majority of the matches they have competed in, therefore the live crowd really had no reason to care about it, especially when presented with a technical bout, Kingston and Miz would've been better off wailing each other in the head with random items for eight minutes, if they wanted this crowd to react. A promo for this year's Tribute to the Troops ran, proclaiming the show “The Most Patriotic of the Year” with appearance from some fella called Jeff Dunham and a group called Daughtry. Yeah, I'll probably give that one a miss. This one had to offer something different from the Punk-Shield match from earlier in the evening, and luckily it did. There is no one in WWE at the moment that can do fighting from underneath like Daniel Bryan and fight from underneath he did here. Luke Harper and Erick Rowan looked fantastic in the early going picking apart the smaller Bryan, with the pattern continuing when Bray Wyatt decided to join the fray. Bryan's numerous comeback attempts were quickly thwarted meaning that by the time Bryan did begin to get some offense in, the crowd were fully behind him, as has been the case for sometime now. Bryan's speed was shown as an asset against the brute strength of the Wyatt's with Bryan managing to take out Rowan and Harper by sending one over the announce table and the other into the steel steps. The finish however indicated that WWE have big plans for Bray Wyatt as he over powered Bryan, with a series of vicious looking elbows strikes, before picking up the victory with Sister Abigail. The result was the right one here, as the balance needed to be struck with the other handicap match, whilst Bryan got in just enough offence to look competitive, whilst Wyatt was allowed a platform to shine in probably his strongest moment on the main roster so far. Before we headed into the main event of the evening it was back to the Kick Off Panel, which was a nice touch as Booker T and Mick Foley really got the importance of the match over, contributing to the big match feel that WWE had been trying to achieve. Personally, I think this match was hindered by the TLC concept, for a number of reasons. Firstly, the big hook of the match was that one man would be walking out with both titles and therefore there needed to be a number of false finishes for both men to really build up the atmosphere and get the crowd involved, this is very difficult to do within the TLC concept, especially with only two men involved in the match. Secondly, neither Cena or Orton are known for having spectacular spots in their matches, something which a match like TLC demands and the fans expect from such a contest, with the only real BIG spot ending up botched as the ladder Cena was on fell away, meaning Cena landed awkwardly on a table in the corner, instead of crashing through it. The titles were also extremely low and could have done with being raised a foot or two, as they were so close to the competitors (even on smaller ladders) that it meant that it looked silly when they didn't just grab the belts, and ended up taking me out of the drama of the match a number of times. There were however a number of nice moments throughout the bout, like the return of the handcuffs from Cena and Orton's “I Quit” match back at Breaking Point in 2009, as well as both men delivered vicious looking chair shots. The aforementioned botched spot was the conclusion of the bout, with Orton taking a looooooong time in pulling the belts down, making it obvious that something hadn't quite gone right, I'm not sure whether there was supposed to be more to the match or whether Orton was simply considered putting Cena through the table properly, but either way it looked rather odd. This was far from a bad match, but it didn't really feel as important as it should have, I would've much rather seen a simple singles match or No Disqualification encounter between the two. After the bout, The Authority's Triple H, Stephanie McMahon and Vince McMahon were out to celebrate with Orton, with Vinny Mac's music playing to close the show, once again undermining Orton as the WWE World Heavyweight Champion, which was a shame as this really should have been Orton's time in the spotlight. Overall, this was a decent PPV with some good storyline continuation in the three-on-one handicap matches, and the tag team four way stealing the show as match of the night. Whilst Orton and Cena ultimately couldn't create a classic in their TLC encounter, it was passable fare and I'm interested to see how having a sole World Champion effects the landscape of WWE as we head towards the Royal Rumble in January.